Below are several pictures that I took on our last trip to England. Please click on these to see them larger. I think I'm getting better. Enjoy. 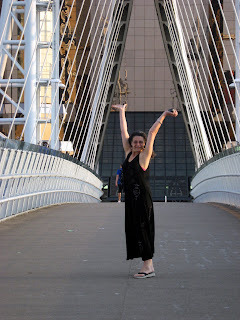 Here is Susan in all her glory posing on the pedestrian bridge that links Salford Quays with Trafford. 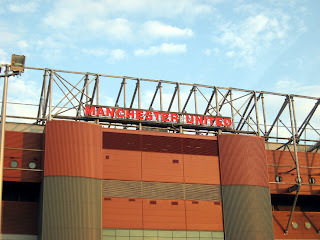 It is a short 10-15 minute walk to Old Trafford where Manchester United plays their football. 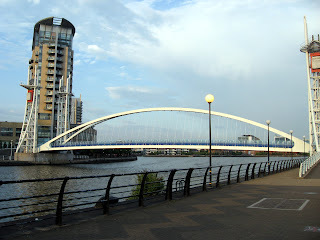 The bridge actually goes up when large ships enter this area via the Manchester Ship Canal. You can catch a cruise from Salford Quays (pronounced "keys") to Liverpool through this ship canal. 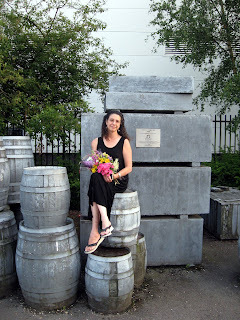 Susan is sitting on an outdoor art installation that celebrates the historical importance of Manchester and Salford Quays as a shipping mecca. 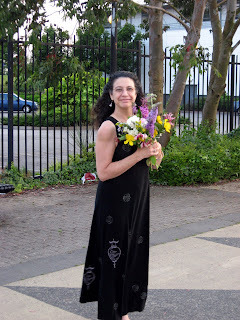 Susan is now posing with a beautiful bouquet of wildflowers that she picked during out stroll to Old Trafford. I hope it was not illegal!! This picture is another view of the pedestrian bridge. The tall building on the left is where our rental apartment was located. The place could not be more convenient to The Lowry where BRB performed. If anyone ever goes to Salford Quays or to Old Traffford to see ManU play, this is a great option to stay; but book early. A link to the website that I used to secure this apartment can be found by clicking here. 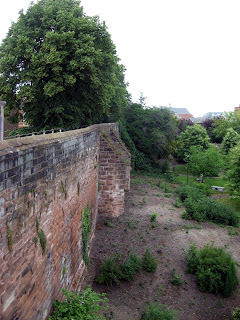 This is a photograph of part of the Roman Wall that surrounds the city of Chester. 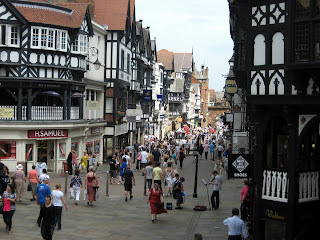 Chester is unbelievably charming and has wonderful architecture. Susan has other pictures of Chester on the family blog, but I do not know if she has this shot. 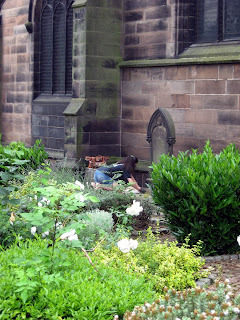 Here we have Susan taking a grave rubbing from an old tombstone dated ca 1680. She writes in detail about our visit to Eccles and their charming Norman church on the Family blog. 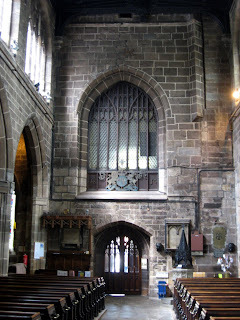 Here is an interior shot of St Mary's Church in Eccles. Not a bad photograph.